Go ahead and do a double-take. Don’t second guess yourself – Saint Lucy is holding a plate with a pair of eyes in the top image, and in the bottom image the saint’s eyes transposed into some type of lovely flower (!). 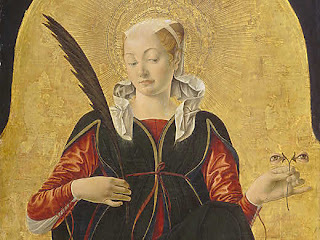 I think that the stories of Catholic saints are really interesting, and Saint Lucy is no exception. The Catholic Encyclopedia gives interesting details about Lucy’s life, but doesn’t mention one of the fascinating legends regarding Lucy’s eyes. I imagine that this legend has affected more representations of Lucy than anything else. 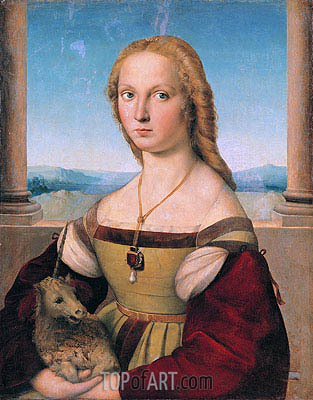 Lucy of Syracuse lived in the 4th century, during the time that Diocletian persecuted the early Christians. According to legend, Diocletian gouged out Lucy’s eyeballs but later her eyes were miraculously restored. The miracle must explain why in art she is holding her eyes, while also having eyes in her sockets. Anyhow, I’m sure that patrons and worshipers wouldn’t particularly enjoy looking at a representation of an eyeless woman. Socket-filled saints are more aesthetically pleasing. It is thought that this legend may account for Saint Lucy being the patron saint of the blind (and those with eye trouble). The name “Lucy” means “light,” and this also might tie into the saint’s connection with sight. 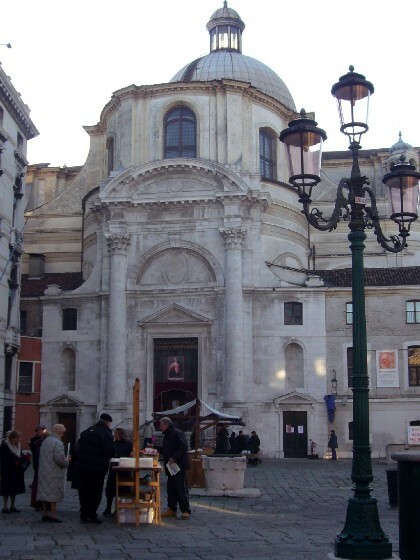 Today, Lucy’s remains are housed in the church of San Geremia (Venice). There are a lot of saints that I find fascinating (you can read about thousands of them on the Patron Saint Index). 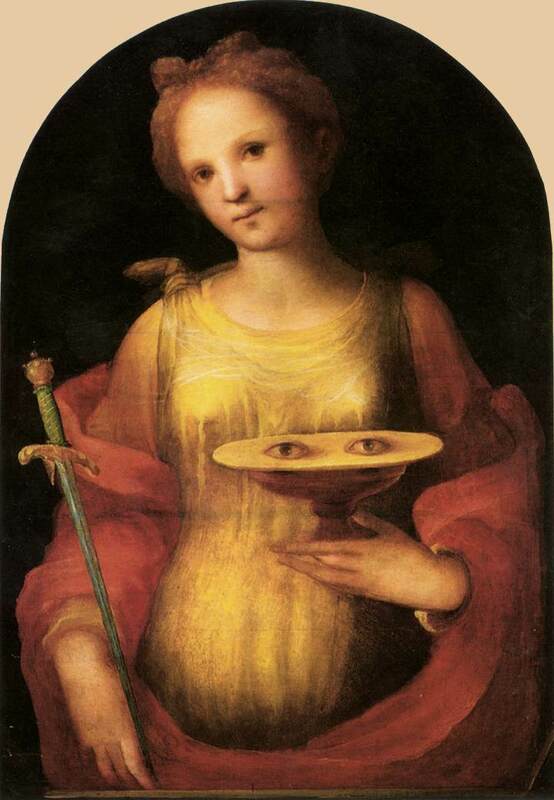 However, in terms of art, I might have to argue that Saint Lucy is the most interesting and attention-grabbing. Who are your favorite Catholic saints? Do you know of a saint symbol that is more unusual than a pair of eyeballs? I have to admit, I’ve never thought that the Vietnam War Memorial (1981-1983; National Mall, Washington DC) was especially interesting or intriguing. I think it is a serene, respectful tribute to those who died in the Vietnam War, but I can’t spend hours and hours thinking about the aesthetic or design of the structure. Don’t get me wrong – I like the feel and look of minimalist sculpture and architecture, but I just can’t pontificate much about the, uh, minimal qualities of the work. 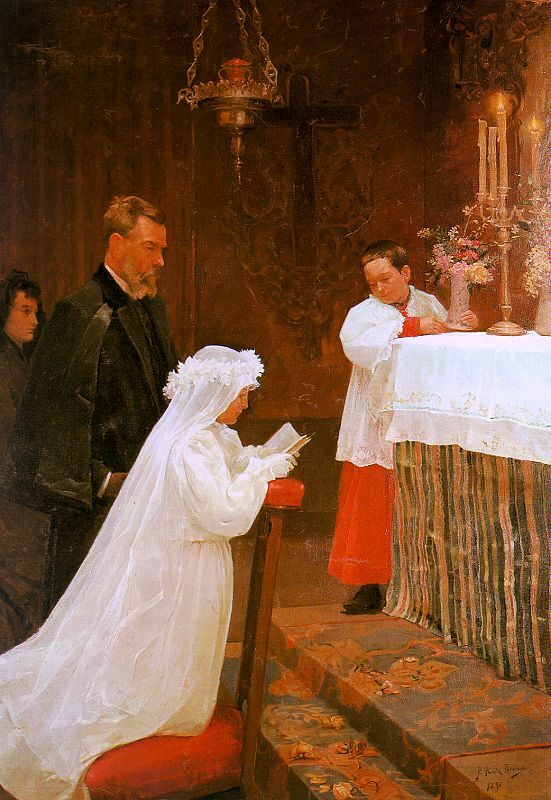 (And art historians love to pontificate!) For this reason, I’ve always kind of skimmed over the Vietnam War Memorial in my art history textbooks and lectures. However, one of the reasons I started this blog was so I could learn more information about various art pieces and (hopefully) gain more appreciation for them. So, in light of Memorial Day, I decided to read more about the Vietnam War Memorial. And I’ve learned some fascinating information about controversy that surrounded the completion of this memorial. 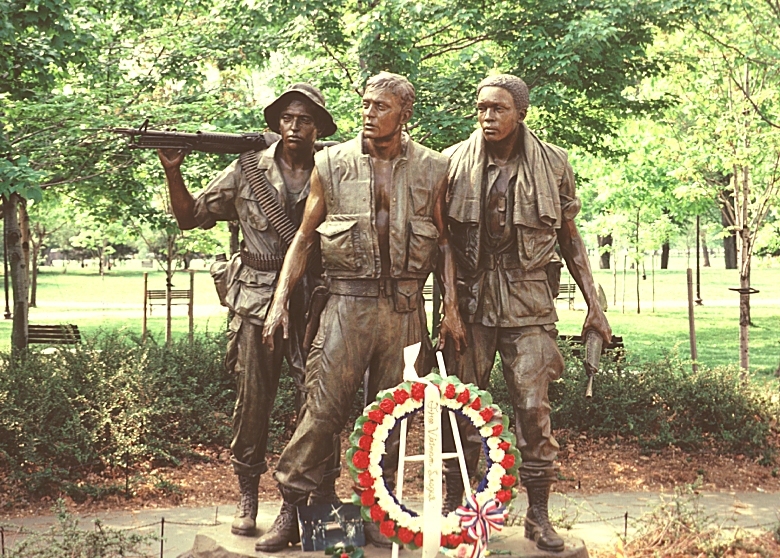 As a compromise, the Commission of Fine Arts decided in 1983 to commission Frederick Hart to create a realistic bronze sculpture of three armed soldiers (shown right). This sculpture which was eventually placed about 100 feet from the memorial wall. About a decade later, a group of nurses got permission to erect a sculpture honoring women’s service in Vietnam. Glenna Goodacre was commissioned to built this sculpture, and it was placed in 1993 about 300 feet south of the memorial (see an image here). I’m a little surprised that Maya Lin’s memorial caused so much debate and controversy, although it makes sense. I think that people usually have strong opinions whenever a memorial is built, because so much emotion is connected to the purpose of constructing a memorial. 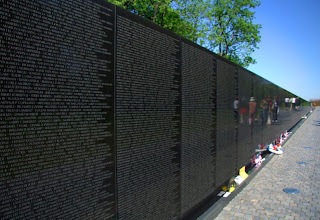 Personally, I think that the black granite is effective and appropriate – the reflective surface ensures that anyone who reads the names on the memorial will become active “participants in the experience of remembering the dead,” because the reader can see himself/herself mirrored against the names. Here’s to remembering our dead, and those who sacrificed so that we can enjoy freedom. The Vietnam War Memorial lists 57, 939 casualties (including those M.I.A.). It’s mindboggling and humbling to think of how many people have died in other wars, especially since our armed forces are overseas at present. What do you think of Maya Lin’s monument? Do you find the design controversial? 1“Lin, Maya.” In Grove Art Online. 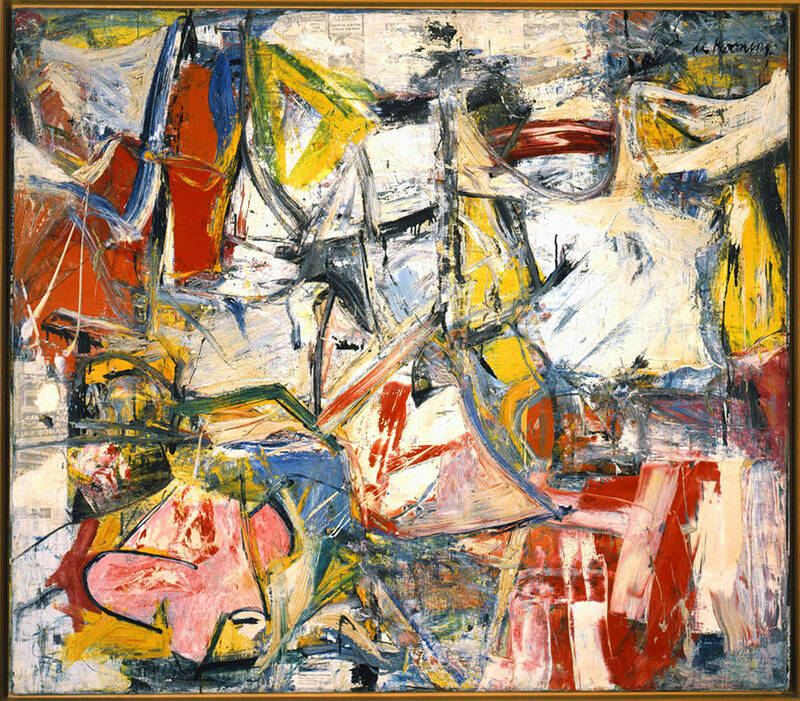 Oxford Art Online, http://www.oxfordartonline.com.erl.lib.byu.edu/subscriber/article/grove/art/T051132, accessed May 25, 2009). 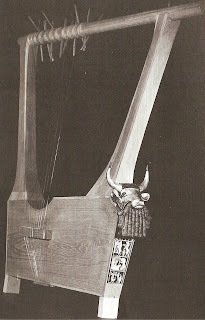 2 Fred S. Kleiner and Christin J. Mamiya, Gardner’s Art Through the Ages, 12th ed., vol. 2 (Belmont, CA: Wadsworth, 2005), 1044. 3 Elizabeth Hess, “A Tale of Two Memorials,” Art in America 71, no. 4 (April 1983): 122. 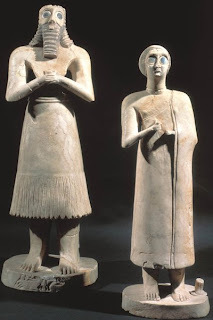 4 “Lin, Maya” in Grove Art Online. Out of these paintings, I think my favorite one is the street scene (second from the bottom). Which one do you like? According to ancient legend, the flesh of the peacock is incapable of decay. Yep, that’s right. It was thought that a peacock’s body would never rot. It would be really cool if this was true, but it isn’t. This myth was propagated by early writers (see here for an interesting example in Augustine’s City of God).1 As a result of this myth, the peacock has been associated with immortality in Christian art. Furthermore, because male peacocks shed and regrow their plumage each year, the peacock also is associated with resurrection. 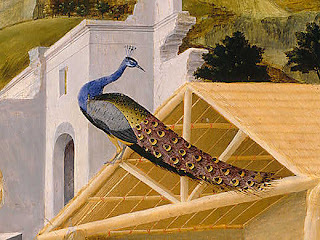 Peacocks have appeared in Christian art for centuries. 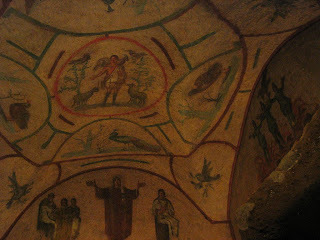 Some of the earthen lamps used by early Christians were decorated with peacocks.2 One of the earliest paintings of a”Christian” peacock decorates the ceiling painting in the catacomb of Priscilla* (3rd century AD, Rome, Italy; the peacock is located in the lunette above the “Life of Priscilla” scene). Since catacombs were the tombs for early Christians, it is appropriate that a depiction of a peacock be included here, due to this assocation with resurrection and immortality. I think it is especially interesting that the peacock is located near a depiction of Christ, since Christ is also associated with resurrection and immortality (Christ is shown as the Good Shepherd in the central, circular frame). I know that peacocks have both positive and negative associations in other contexts and cultures. In America, it could be argued that peacocks are most commonly associated with vanity. I think it’s fun to look at peacocks in a different light, as a symbol of immortality. 1 To see some other examples of early writings (and a great image of a peacock from a medieval bestiary, see here). 2 “Roman Catacombs,” in The Catholic Encyclopedia (2009), accessed 18 May 2009. Found online here. 3 A complete view of the painting (and more information about it) can be found here. *Catacomb of Priscilla image courtesy batigolix on Flickr.